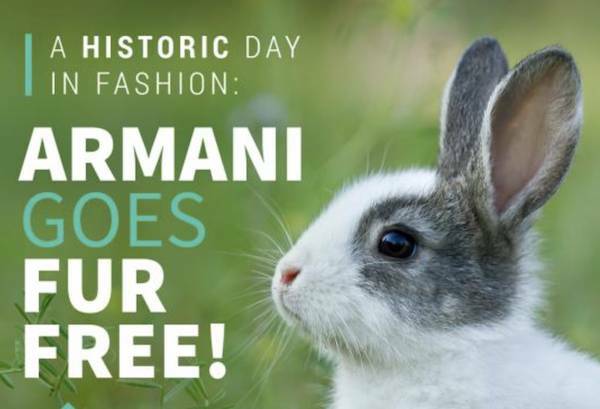 As a member of the Fur Free Alliance, the world’s largest coalition of animal welfare organisations against fur, FOUR PAWS welcomes the Italian luxury brand Armani for committing to totally phasing out the use of real animal fur in its products. Armani will leave out all real fur, including rabbit fur, from its collection starting from the fall/winter season 2016. The brand committed to this policy after working with the Fur Free Alliance. We hope that other big fashion companies will follow the good example of Armani. I am pleased to announce that the Armani Group has made a firm commitment to abolish the use of animal fur in its collections. Technological progress made over the years allows us to have valid alternatives at our disposition that render the use of cruel practices unnecessary as regards animals. Pursuing the positive process undertaken long ago, my company is now taking a major step ahead, reflecting our attention to the critical issues of protecting and caring for the environment and animals. By committing to a fur-free policy Armani joins other high-end brands – such as Hugo Boss, Tommy Hilfiger, Calvin Klein and Stella McCartney - and acknowledges the ethical concerns of a new generation of fashion consumers.